Juan Laureano stands outside his Marktown home in East Chicago, Indiana. Laureano opposes a plan by BP to demolish 10 vacant historic homes within the Marktown neighborhood. The historic English-style Tudor neighborhood of Marktown. Designed in 1917, it’s narrow streets force cars to park on the sidewalk. The Marktown area is surrounded by heavy industry. 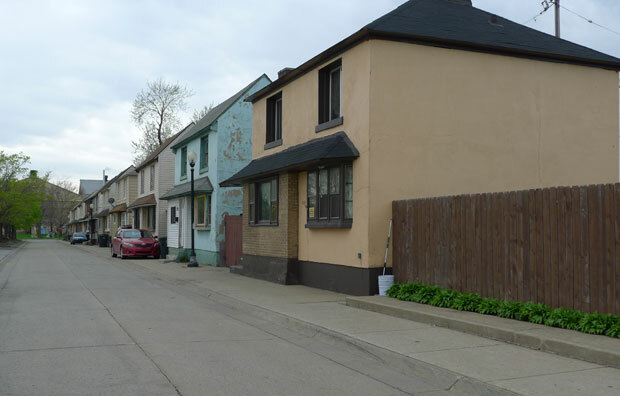 Despite being on the National Register of Historic Places, residents complain that the city of East Chicago, Indiana has done little to preserve and revitalize Marktown. 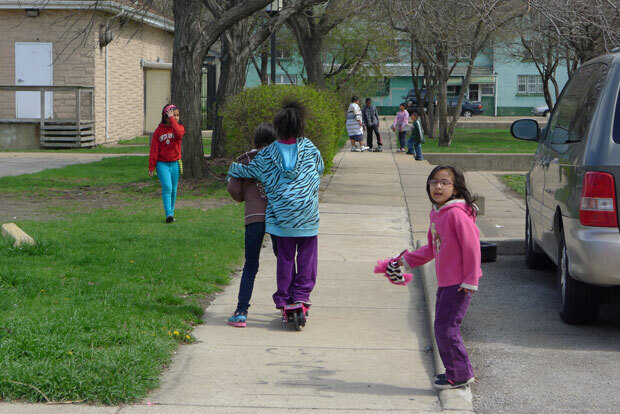 Children play in the streets and sidewalks of Marktown. When Juan Laureano invites friends to his home, it usually comes with a warning. “In the invitations I have to explain to them not to panic,” Laureano says. That’s because to get to Laurano’s home, you have to pass through one of the most heavily industrialized corridors in the country. “BP on side, Safety Kleen on the other, USG, Arcelor, so it’s imposing. But once you arrive here, it’s very peaceful, very quiet. It’s home,” Laureano adds. ‘Home’ is kind of an island. 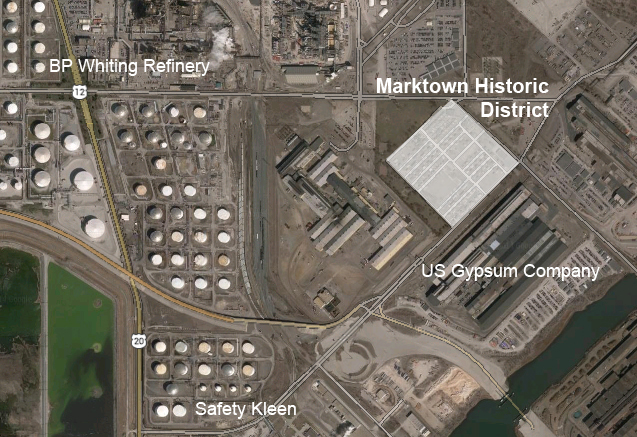 Marktown’s roughly 200 buildings are within the City of East Chicago, Indiana – but cut off from everything around it. With no grocery stores or schools nearby, it’s never been high on “must see” lists for realtors. But five years ago Laureano moved to Marktown from Chicago’s West Side. “You know it’s like someone planted a tudor-style English village in the middle of all this industry. It’s very unusual,” he says. So unusual that people park their cars on the sidewalks because the streets are too narrow. 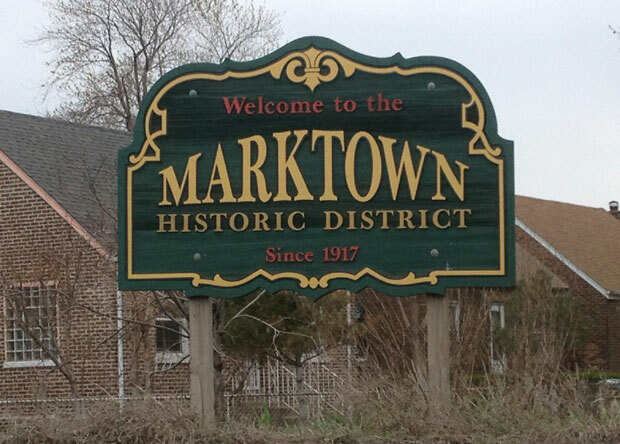 Marktown was originally built by industrialist Clayton Mark in 1917 so workers could live near his factory. The factory didn’t last very long but Marks’ homes did. By the 1970s, Marktown was added to the National Register of Historic Places. The planned worker community is often compared to Chicago’s Pullman, yet it rarely gets the same attention from preservationists. But with the planned demolition by nearby oil giant BP, that may be changing. The 10 structures slated for demolition on Monday are private property and not protected. They’ve been vacant for years. BP spokesman Scott Dean says they were voluntarily sold by the owners of a local tavern called the George Michel’s Bar – the only business in Marktown. Still, Laureano says he can’t believe BP would do this. 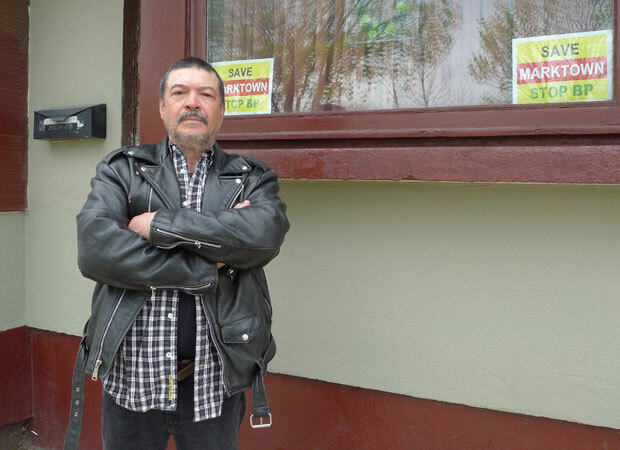 “It’s kind of sad that BP, being a British company, would want to demolish an English-tudor style village and knowing the bad PR that BP has received, they should use Marktown as an example and revitalize it,” Laureano said. In fact, the City of East Chicago hired an architecture firm a few years ago to figure out how to do just that. Architect Ed Torrez, who used to head the Chicago Landmarks Commission and now sits on the Board of Advisors of the National Trust of Historic Preservation, led the project. “I think (the houses) are a living museum, if you will, on how these were designed by a very talented architect, Van Doren Shaw,” Torrez, president and principal of BauerLatoza Studio of Chicago, says. Howard Van Doren Shaw was one of Chicago’s most famous architects in the late 19th and early 20th century. Torrez once brought a bus load of urban planners from around the country to see Shaw’s unique Marktown design in 2010. Torrez said it’s a wonder that Marktown has been around this long. Still, Marktown faces many challenges. Torrez says the area lacks publically-owned land and a business base to generate taxes. His plan called for the city to capitalize on the area’s history to attract more visitors. But while the City of East Chicago is moving forward on revitalizing other areas, Marktown is being left out. Some say, despite its history, the neighborhood still has air quality issues. With nearly 200 structures still in place, BP’s bulldozers won’t mark the end of Marktown, but Rodriguez worries about its future. Meanwhile, East Chicago Mayor Anthony Copeland has offered residents incentives to move to other parts of the city where new development is taking place. Rodriguez says she’s not going anywhere. Michael Puente is WBEZ’s Northwest Indiana Bureau reporter. Follow him on Twitter @MikePuenteNews or visit the WBEZ NWI Bureau Facebook page.